Buyers Products SaltDogg SHPE2000 Electric Poly Hopper Spreader gives contractors and facility managers a low-volume hopper spreader ready for residential or commercial use. Electric power means quieter operation with no need for refueling or engine servicing. The durable 2 cubic yard poly hopper features a patented double-wall construction. 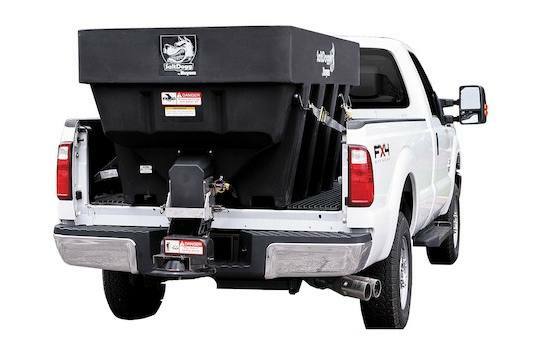 It fits a 3/4 ton or 1 ton pickup truck and uses a bulk salt or a salt/sand mix. The SHPE2000 also comes outfitted with a top screen, tie downs, fitted tarp, and remote auger bearing grease kit. Overall Width (at top): 47.80 in. Fits a 1 ton truck with a minimum 6 ft bed. Patented double-wall, 2 cubic yard poly hopper is available in red, yellow and black. Won't rust or dent.